Alison Kock is a marine biologist at the Cape Research Center, South African National Parks. She is a Honorary Research Associate at the South African Institute for Aquatic Biodiversity and the Institute for Communities and Wildlife in Africa (UCT). 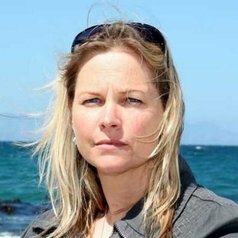 Alison completed her PhD in biological sciences at the University of Cape Town and her research interests lie in the areas of conservation biology, top predator conservation, behavioral ecology, marine protected areas and biodiversity monitoring. She currently serves on the executive committee of Shark Spotters, a non-profit organisation whose vision is the sustainable co-existence of people and sharks and is the project leader of Sharks on the Urban Edge, a keystone project funded by the Save Our Seas Foundation. Alison is committed to conducting research that is applied to education, management and policy. She is a qualified boat skipper, rescue SCUBA diver, loves wild open spaces and is fascinated by sharks. First observations of dusky shark (Carcharhinus obscurus) predation on a humpback whale (Megaptera novaeangliae) calf. , Marine and Freshwater Research.